Joseph Coriz was born in 1958. Although he began his career as a draftsman, he soon was inspired to follow in the footprints of his parents, who were very successful at making beautiful hand made jewelry. Joseph uses his artistic skills to create his own unique style. He combines traditional methods of hand crafting intricate overlay jewelry and adds his own unique contemporary flare. The work of Joseph Coriz is very distinctive and easily recognizable. He works primarily with sterling silver highlighted by solid 14K gold. 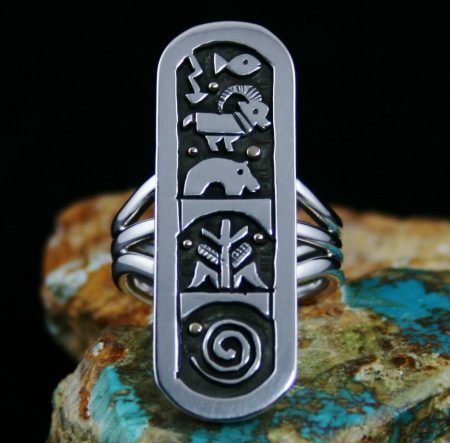 His themes often involve petroglyphs, the earth-creating turtle, and corn or maize, symbol of growth and prosperity. With his dramatic overlay and stamp work he is able to allow his creativity to flourish, creating some of the finest jewelry available today. 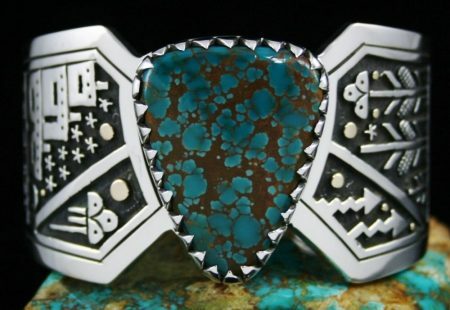 His creations include rings, necklaces, bolos, pendants, bracelets, earrings, buckles, and concho belts. His awards include: Santa Fe Indian Market, Eight Northern Pueblo Art Show, Colorado Springs Art Show, New Mexico State Fair, and the Heard Museum Art Show. Overlay art and indigenous designs from his pueblo heritage sets Santo Domingo jeweler Joseph Coriz apart from all but the most talented of his peers. 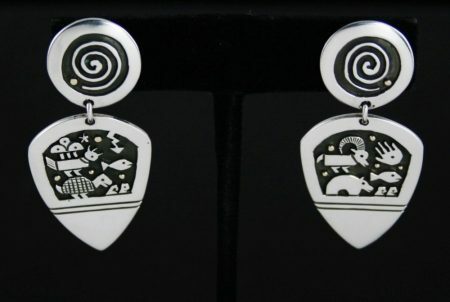 This pair of earrings is the "gathering of the clans" design. They feature the bear, fish, bird, snake and antelope clans gathering together in ceremonial fashion. Solid fourteen karat gold droplets and deep oxidation make the detail of the piece pop. Below the clans flashes of lightning signify the beginning of the monsoon, so essential to the survival of the crops that feed the people. Atop the dangle are two perfectly matched gem grade natural Blue Gem cabochons, turquoise sacred to the tribe. The gems are classic deep blue with fine water web matrix. This mine is no longer producing. 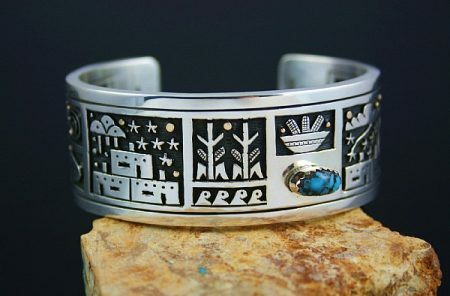 Santo Domingo Pueblo jeweler Joseph Coriz has created this wonderful bracelet by overlaying scenes from pueblo life. The village is represented at night with moon and planets of solid 14 karat gold and sterling stars up above. Two large corn plants are displayed right of center essential for the sustenance of the people represented on the left hand side of the piece. Nine water waves are included beneath the crops with the storm cloud, rain, lightning, wind in a swirl and hand for healing to either side. 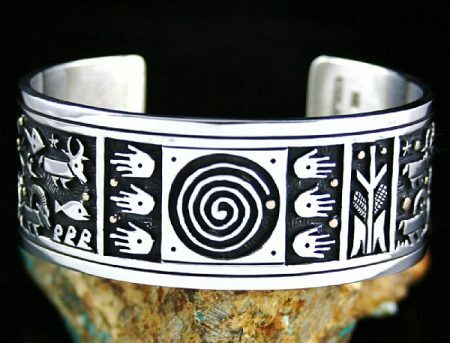 The bird, ram, bear and fish are represented on the right side of the bracelet with the bowl of corn just below. 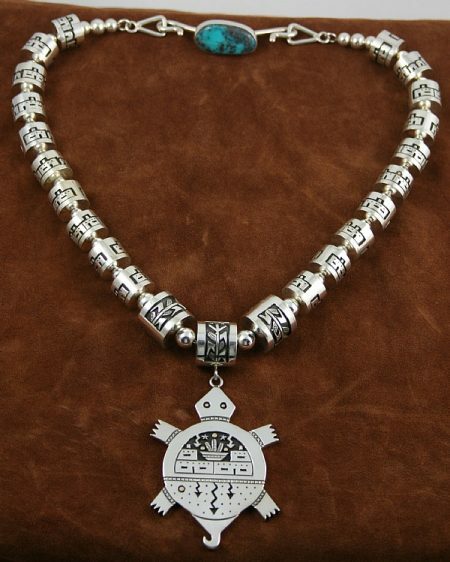 Santo Domingo Pueblo master overlay artist Joseph Coriz has created this exquisite necklace out of sterling silver with solid 14K gold accents representing the planets and moon. This necklace is exceedingly rare as it is extremely labor intensive. Each bead is produced and overlayed on every side. Joseph hand cuts each symbol and overlays them with tremendous skill. 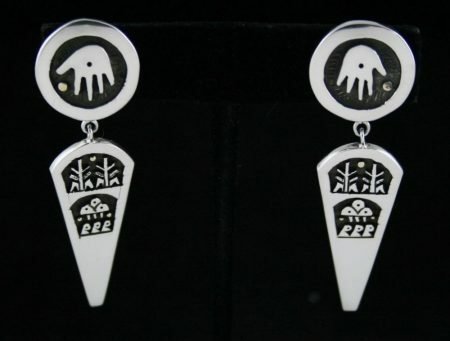 The symbols are drawn from pueblo life and represent the village, corn, water, hands of time, storm clouds, shooting stars and rain all set against the night sky. The turquoise in the pendant and clasp is rare high grade natural Morenci from the artist's collection. The artist's incredibly innovative imagination allows the owner to wear the pendant on the beads, to the side as a pin, or to wear either by themselves. 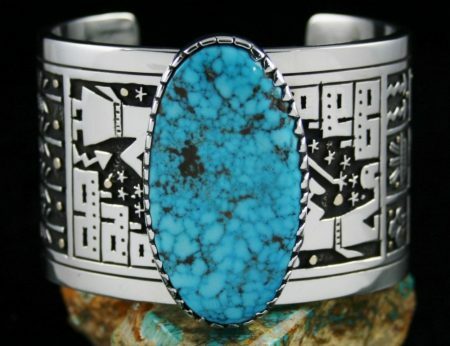 Santo Domingo Pueblo jeweler Joseph Coriz has created this storyteller bracelet with his signature designs. The migration symbol sits in the center of the bracelet shank. On one side are the clans represented by the animals. On the other side are symbols of abundance such as rain clouds lightning and crops. The scene is the night sky with solid 14K gold planets, stars and moon. 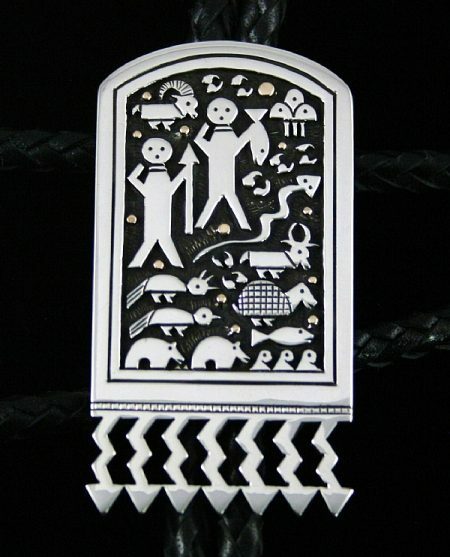 Santo Domingo Pueblo artist Joseph Coriz has created this beautiful one of a kind bolo tie by overlaying precise cutout figures onto sterling silver. The bolo displays two pueblo figures, one with a fish signifying abundance and the other with an arrow by which game is procured to feed the people. The figures are surrounded by the clans people portrayed by the goat, deer, bear, fish, snake and turtle. This is a night scene with several solid 14K gold planets in the background. The bottom of the bolo features seven lightning bolts symbolizing the coming of rain and bountiful crops. 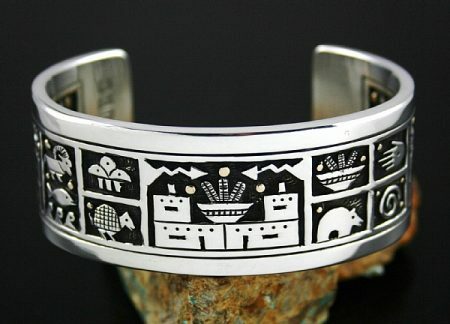 Santo Domingo Pueblo master jeweler Joseph Coriz has created this marvelous two sided overlay bracelet by individually cutting out the design by hand and overlaying them together. The result is a heavy gauge bracelet of distinction. The theme of the design is the pueblo homeland and the creation mythology, the hope for rain to grow the crops and the abundance that nature provides to the people. 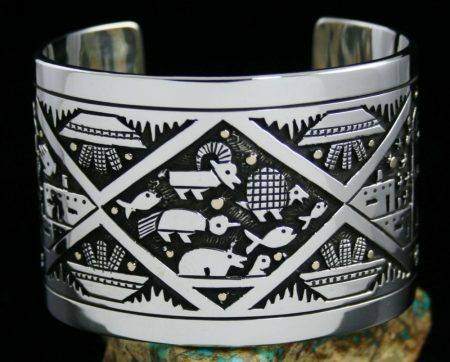 The top of the bracelet portrays the clans in the form of the turtle, fish, goat and bear. At either end is a pueblo night scene, one with the clouds and the other with the corn. 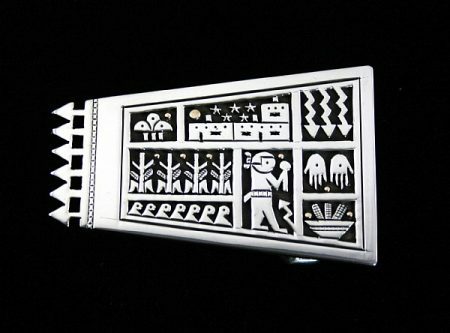 The interior of the bracelet is a beautiful complete pueblo night scene with stars, clouds and moon. Each section of the piece includes solid 14K gold accents representing the moon and planets. 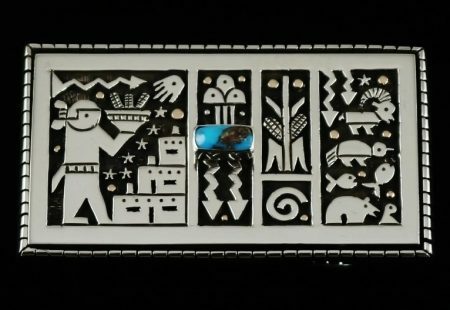 Award winning Santo Domingo Pueblo master silver and goldsmith, Joseph Coriz, hand made this marvelous one of a kind belt buckle. With a total of eight exquisite scenes and a unique shape this piece is of the finest quality. The buckle has a consistent theme of the success and growth of the pueblo with four corn stalks bearing corn to feed the people. The dancer calls for the maturation of the crops with the rattle in hand. Water designs essential for all life are displayed beneath the corn with rain and storm clouds above. 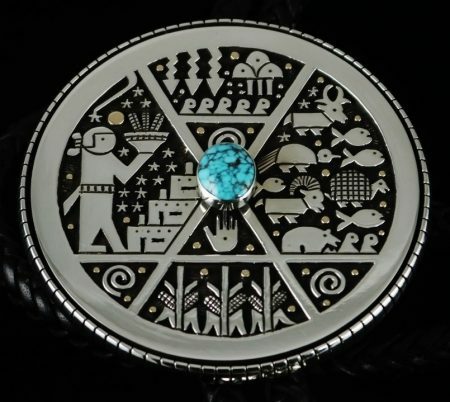 The piece includes a pueblo home with solid 14 K gold moon and stars with lightning designs, hands for healing, and a bowl of maize. The incredible arrow design cutouts represent the cycle of life and renewal over time. We have the great privilege of representing Joseph Coriz with this piece on page 161 of Dr. Gregory Schaff's definitive new book American Indian Jewelry II: A-L 1,800 Artist Biographies. 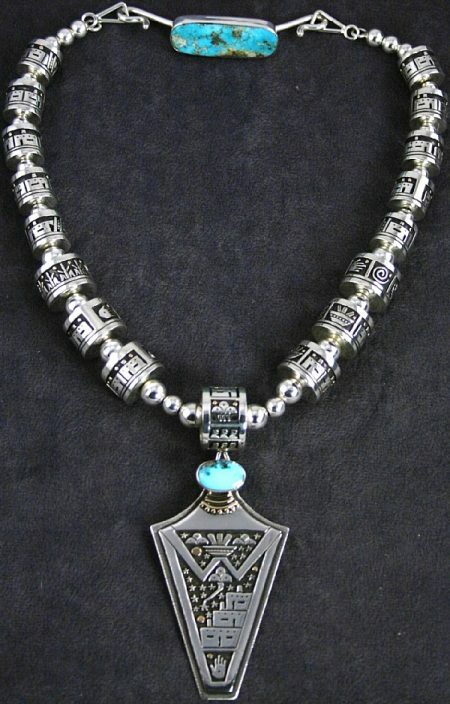 This spectacular one of a kind pin pendant was hand crafted by award winning Santo Domingo Pueblo artist, Joseph Coriz. The turtle symbolizes the life bearing animal who carries the weight of the world on it's back. This magnificent creature features an incredibly intricate pueblo scene under a starry night sky with a shooting star as well. Solid 14K gold is displayed for both the eyes of the turtle and for the moon. The artist outlined the body of the creature with amazing skill and precision with cutouts and stampwork outlining the feet and the tail curving out to one side. 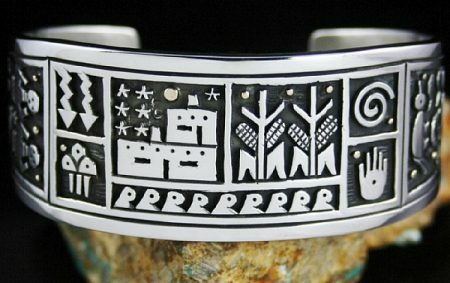 This exquisite double sided overlay bracelet was hand fabricated by award winning Santo Domingo Pueblo artist, Joseph Coriz. 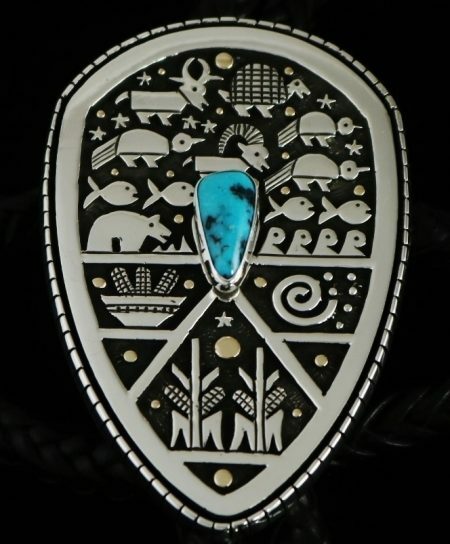 The piece has a consistent theme of prosperity, with corn, symbolizing growth, prayer mounds for inspiration, a pueblo under constellations with gold moon, and rain clouds for renewal. 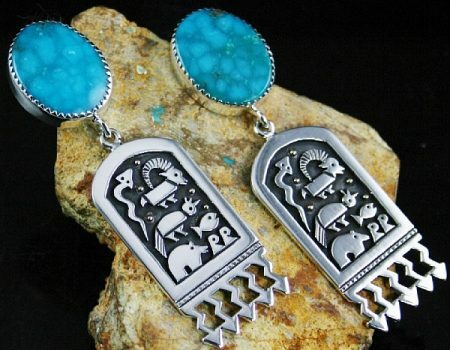 Each side panel also has amazing intricate scenes with a basket of maize for growth and prosperity over turquoise, which represents healing, set in a 14k gold bezel. On the inside of the item, the artist included a total of eleven separate scenes with a similar theme. A turtle is portrayed known for bearing the weight of the world on its back, a bird design, fish, corn crops, bear, ram and pueblo home are outlined with precision. An incredible work of art. 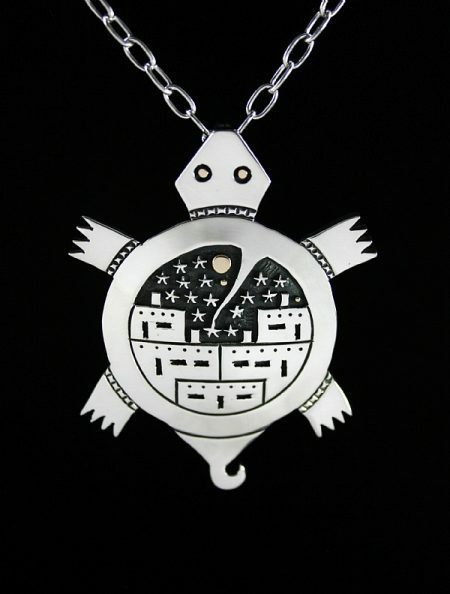 Award winning Santo Domingo Pueblo master silver smith, Joseph Coriz, hand crafted this exquisite one of a kind double sided turtle design necklace. The item is set with a rare gem grade Bisbee turquoise clasp, with a gorgeous deep blue hue, and reddish-brown matrix. Twenty two hand made overlay beads are included with this piece with individual pueblo scenes, two with corn crops for growth and prosperity and solid 14K gold drops. The turtle symbolizes the life bearing animal who carries the world on it's back. On one side of this magnificent creature, a pueblo scene is portrayed with a bowl of maize (corn), lightning, stars, and gold droplets. Solid 14K gold is featured both as the eyes of the turtle, as well as towards the lower left corner of the piece. The other side features both corn crops, and the bowl of maize, with lightning symbols, and three solid14K gold drops. A hand for healing with gold, lightning, and a large gold droplet are featured as well. The bale of the item includes designs of corn, lightning, and water. The artist outlined the body of the creature with amazing skill and precision. The labor involved in creating a piece of this magnitude is substantial, making it highly collectible.